An accountancy student was found dead inside her house in Cebu City on September 15, 2015. The police of Lapu- Lapu City are still on the hunt to identify the suspect who allegedly raped and killed the college student. The victim identified as Karen Kaye Montebon was a 17 year old college student who lives with her family in Corinthians Subdivision, Barangay Suba-Masulog of Lapu-Lapu City. Her body was found by her father in the house after he arrived home at around 5:30 in the afternoon. The police had reasoned to believe that the crime took place in the morning at 7am towards 8am after the family had left home. The student usually goes to school at 10 am, yet she never got to her classes. According to her father, James, he was shocked to discover his daughter’s dead body under her own bed. A cord of hair straightener was found around her neck and may have been used to choke her. Upon investigation, it was found out that the girl’s DLSR and iPod were missing. Her father brought immediately brought her body in Mactan Doctor’s Hospital and she was not only confirmed dead, but also it was found out that she was raped. Her underwear was stained with blood. According to the Lapu-Lapu City PO3 Jerson Alparito, an autopsy is set to done to help with the investigation. The suspect is still yet to be identified, however, a pair of slippers was seen outside the victim’s house that might serve as a clue. 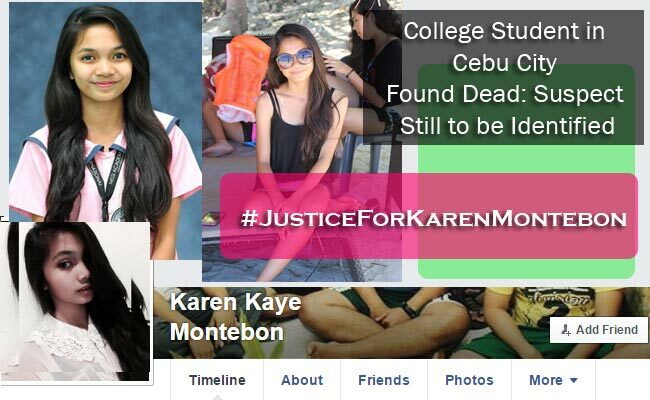 In the meantime, the victim’s friends, classmates and co-students in University of San Carlos took to social media their call for justice and the hashtag #JusticeForKarenKayeMontebon is now starting to circulate in various social media sites.